This one is a long time coming. 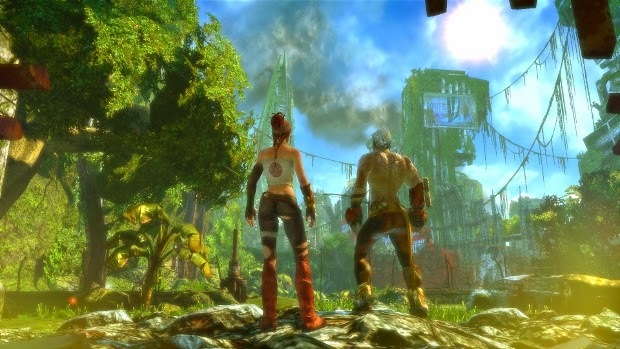 Enslaved is just one of those games that everyone who's played it says is good, and yet very few people end up playing it. It just has this quality that says "you don't have to play me right now, go ahead, wait until I'm cheaper". At least, this was the case for me until I finally picked it up for a measly $5 on PSN. Having now played the game to completion, I thought I would talk a bit about it, if for no other reason than to try and get straight my own opinion of it. You see, Enslaved is a really weird case to me... Allow me to explain. Enslaved starts out really strong. From the get go you are thrown into the action with no expository introductions. The game opens with a tutorial section that is perhaps a little over done, but considering you are at the time escaping from a crashing airship, I feel as though the action excuses the tutorial a bit. Beyond the first chapter, the game does a good job of never really taking you out of the action too long. The game's story doesn't try to be over complicated, and is told largely through or in parallel to gameplay. What's more, the characters are all quite genuine, and listening to them talk is never annoying or disinteresting. In particular, Andy Serkis does a stellar job as the main character Monkey. Monkey isn't really your average protagonist. He's a big brute, he's very angry, and everything from his voice acting to his fighting style to the dramatic kill cam the occasionally pops up really hammers home this point. He has pretty good reason to be, to. Early on in the game a girl named Trip fits a slave headband on Monkey, tying his life to hers and forcing him to do her bidding. She is terrified of Monkey, but she also realizes that he is her only hope to get home. What I found really interesting about this though, is that it very quickly becomes unclear who is the real master here. Monkey may have to do what Trip commands, but at the same time Monkey has no qualms telling Trip what to do. In fact, giving Trip orders is a somewhat big part of the gameplay. It's not even annoying, like most escorting tends to be. Seeing how the two characters interact in such a strange, stressful situation is pretty cool, even if where it all leads is fairly predictable. Unfortunately, that's kind of the story of Enslaved I feel. On the surface everything looks and feels pretty stellar. The game actually reminds me a lot of Uncharted, which is pretty high praise. The graphics are superb and colorful, the gameplay does a good job of mixing combat, climbing and puzzles. Even the way Monkey runs around feels similar to controlling Drake. Everything is really well polished and the presentation is excellent. And yet... The game feels lacking somehow. Like they were trying to paint this beautiful picture, and they did, except instead of painting it on canvas they were painting on printer paper. Sure what's there is a work of art, but what's underneath isn't so great, and it drags down the quality as a whole. 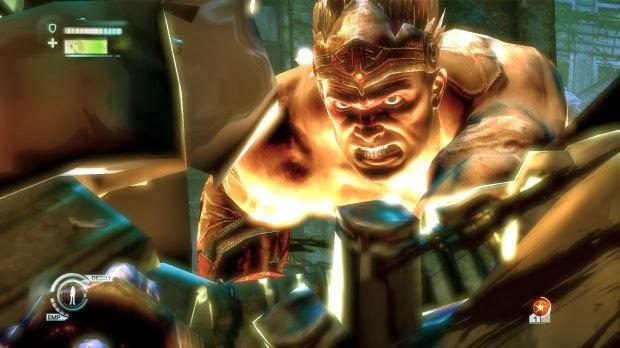 None of the issues behind Enslaved are massive, thankfully. Most of it comes down to minor annoyances. The camera is wonky here, jumping from this pipe to that pipe is weirdly picky, there are a few too many platforming sections, the few puzzles in the game, are tedious and not very rewarding, the game feels like it wasn't designed with regenerating health in mind (granted, it's an optional upgrade) etc. Probably the biggest complaint is the combat. There isn't as much of it as you might think, but what's there is pretty simplistic. You just kind of beat on things until they die, and it's way too easy up until about 2/3 of the way through the game. At that point you have to start using your abilities a little more wisely, but combat transitions straight from mindless to irritating. Enemies can decide they want to be blocking or start attacking you at seemingly any time and there isn't really anything you can do about it. Combat just felt tedious, and considering how well Monkey's rage is conveyed, you would think smashing mechs would be more fun. There are a couple hours in the middle where the game really drags, too. I suppose what I'm trying to say here is that, Enslaved is definitely an impressive game, I enjoyed playing it. It's a much better experience than a game, though. It's really weird to me, to see a game with so much polish have so many little design issues. One would think that part of polishing the game would be also tweaking the design, but the issues are there none the less. Most of them are pretty easily overlooked, but they come up often enough that it feels like there's always something to be annoyed at. It's pretty common to see a game with lots of potential end up being mediocre, but Enslaved is perhaps the first game I've seen that is mediocre at it's core, but polished so heavily that it ended up being pretty darn good. If you are more willing to overlook gameplay flaws (and I'm almost positive that you are) Enslaved is definitely worth checking out.